Cooking outdoors no longer has to mean compromising with the versatile Plancha L. Featuring a powerful double burner that offers fast and consistent heat across the non-stick, enamelled cooking surface, the table-top barbecue makes it easy to prepare a wide range of family favourites. 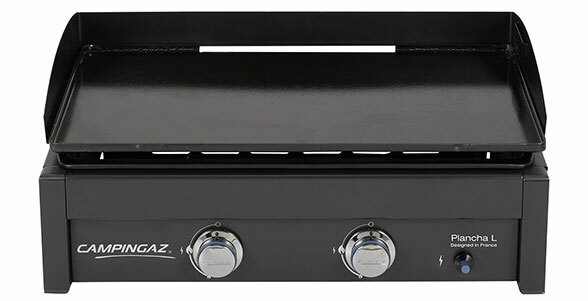 From fresh and healthy griddled vegetables to tasty steak or seafood – with the Plancha L the possibilities are endless!Supplied with a handy spatula for traditional Plancha cooking, the slim-line barbecue also benefits from convenient Piezo ignition. As quick and simple to clean as it is to cook on, the Plancha L’s large cooking surface can be completely detached for effortless cleaning.